Enjoy Alexia Purdy's Books? Tell us Why and Win a Free Book! 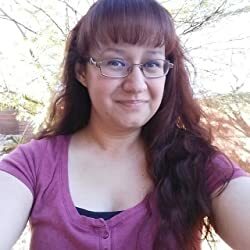 Welcome to Alexia Purdy's BookGorilla Author Page! We're working hard to bring you the best deals ever on Alexia Purdy's Kindle books. If you’re a Alexia Purdy fan, we'd love to have your help in making this author page special. Tell us, in no more than 150 words, why you think Alexia Purdy is great. Use this webform to send us your submission, and if we select yours we'll offer you one of Alexia Purdy's books or a Kindle Gift Card as a free gift! Thanks! Please enter your email address and click the Follow button to follow Alexia Purdy! After her mother dies, Melanie must live at boarding house for girls until she is of age. If only the place wasn't haunted and the caretaker's daughter, Ruby, wasn't so darn determined to show Melanie the house's deepest secrets. When secrets are deadly, only the light can save you. Welcome to Wicked Grove, where magic runs wild. Hayden didn't plan on being contaminated during a routine extermination of a rogue wolf pack. He didn't count on it changing everything he believed ties humans and supernaturals together.